I’ve been slowly working on my squid quilt. I’m sewing the hexies together in angular rows, and I’m on the 14th one (50 altogether). I’m hoping that sewing the rows together will not be too hard. I would try to sew a couple together now, except I really want to pick out a border fabric first and make extra hexies to go around the whole thing. 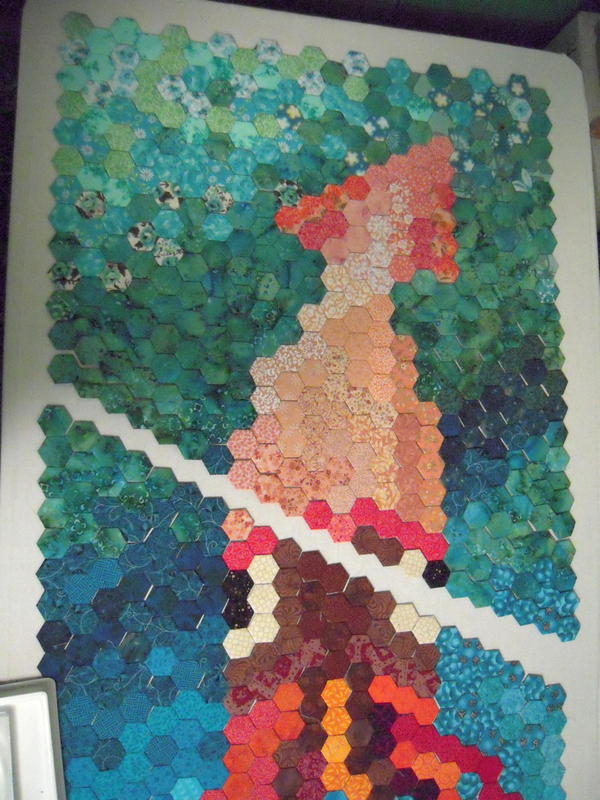 If I do that, I should sew the border hexies on the ends of each row before sewing the individual rows together. That said, I’m having a hard time deciding on a fabric for the borders of this quilt. Currently, I’m thinking a solid (or very subtle pattern) aqua blue color. If anyone has a suggestion as to a specific fabric they would use ~ I would love to hear it! Eventually I want to quilt the water with a free motion pebble pattern as shown here. I LOVE how that kind of quilting looks, but I don’t know if I can do it well enough for this quilt or not. Time to practice!! I have to get over to Modern Domestic already. I keep hearing about it through PMQG and I still haven’t had the chance to get there myself. From what I understand it is an open sewing studio where you can pay by the hour to use their space, tools and machines… and I’m guessing they would have a great sewing machine in which I can try some pebble quilting with! I have a few smaller projects that I can test it on and if they turn out good, then I’ll try the quilt. There is plenty to do, and my project list will take me a few years (or decades) to complete, so I’ve given up on being in any kind of rush. I just work as I can, and try to enjoy the process. I was hoping to be much farther in this squid project, but times are very busy for my husband and I work-wise. We have a small screenprinting business together that we run out of our home studio. It’s just the two of us, and he is having a big surgery in 3 weeks and afterwards he won’t be able to print for at least 6 weeks. That means that we have to work as hard and as fast as we can to get all our work done by surgery time… then we have to hope that we will have brought in enough $$ to get us through 6 weeks of recovery time, and the deductible. So… not much sewing time for me right now. Luckily when he is all laid up, I’m going to take advantage of the time and try to wail through a bunch of neglected sewing projects! 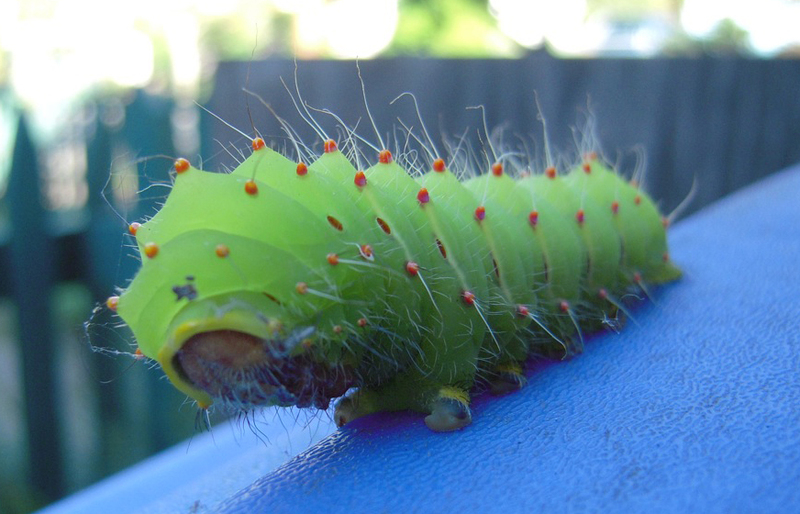 Here’s a quick pic of a cute caterpillar I found on our recycling bin the other day… just wanted to share ~ he’s so cute (check out his little feet)! Previous PostPrevious … and another Pin Cushion!